When is a high-end audio showroom not a showroom? 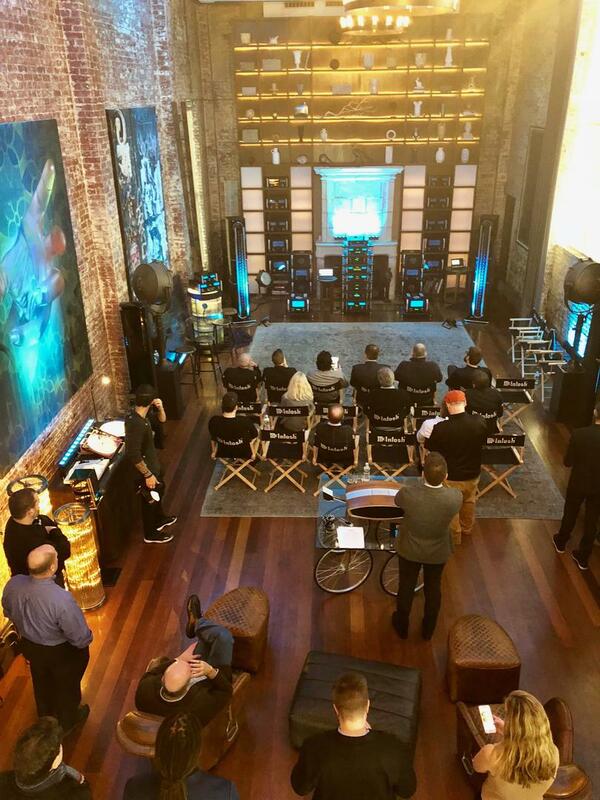 When it elevates a visitor’s experience beyond expectations, when it is more than just a bunch of skillfully set-up gear in a nice-looking room. 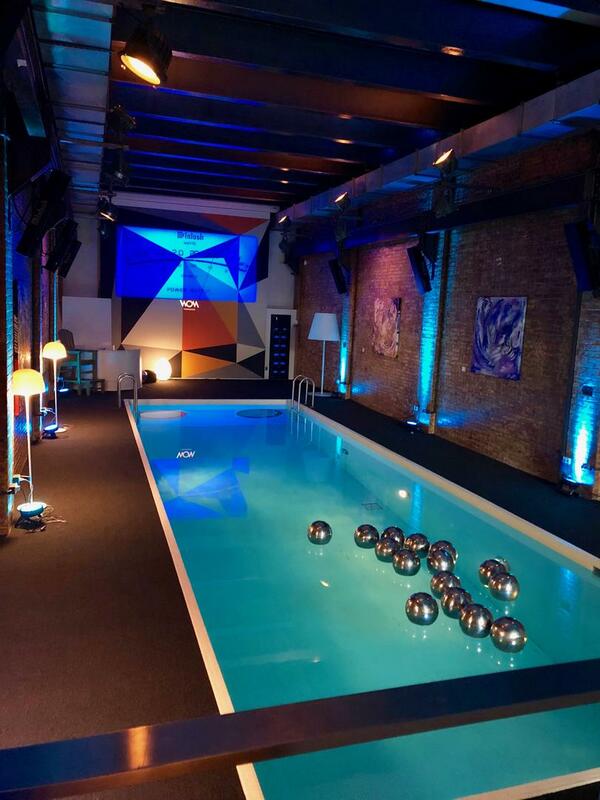 Take the World of McIntosh townhouse, the mise en scène for a two-day event last week in NYC. Like the iconic McIntosh brand, the circa-1890 building in Soho, Lower Manhattan also has a storied history. In early days it served as a sub-power station that supplied current to the subway and a good portion of lower Manhattan. Cut to the 1980s, when it served as an art space within a creative-hotbed neighborhood in transition. A handful of works of art still grace the walls—a large Keith Haring drawing along with some other contemporary canvases. Since 2015, the McIntosh Group has taken the townhouse on long-term lease. Other entities, such as Universal Music Group, also host live music and other diverse events there. In its grand (some might say grandiose) way, it still offers a residential, quasi-“home-like” feel for the listening experience. A handful of members of the audio press and a number of dealers and company representatives from McIntosh and Sonus faber (two of the companies under the McIntosh Group’s umbrella, alongside Audio Research, Sumiko Audio, and Wadia) were invited to spend the better part of two days at this historic, high-style WOM townhouse to learn about and listen to a diverse array of new offerings. It was my third visit there, and for the first time I didn’t schlep any LPs from home—“bring your own vinyl (BYOV)”—though I did tote a few choice CDs. The townhouse is, indeed, an extraordinary place: There’s an indoor pool on the second floor, the depths of which can be seen through a rectangular “porthole” window behind the reception desk on the first floor. Yes, there’s a sound system of mounted loudspeakers in the pool room. And no, we didn’t swim. As in a loft space, there’s also an open-plan, full-service kitchen within the main room where delectable Italianesque catered meals were prepared and served for the occasion. 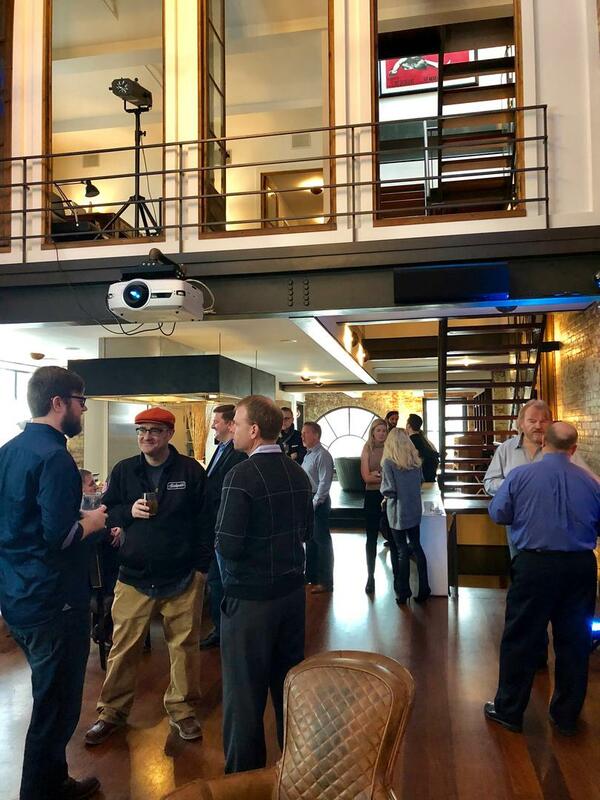 All in all, it was an ideal environment in which to transition smoothly from new product presentations to listening demonstrations, with lunch in between. 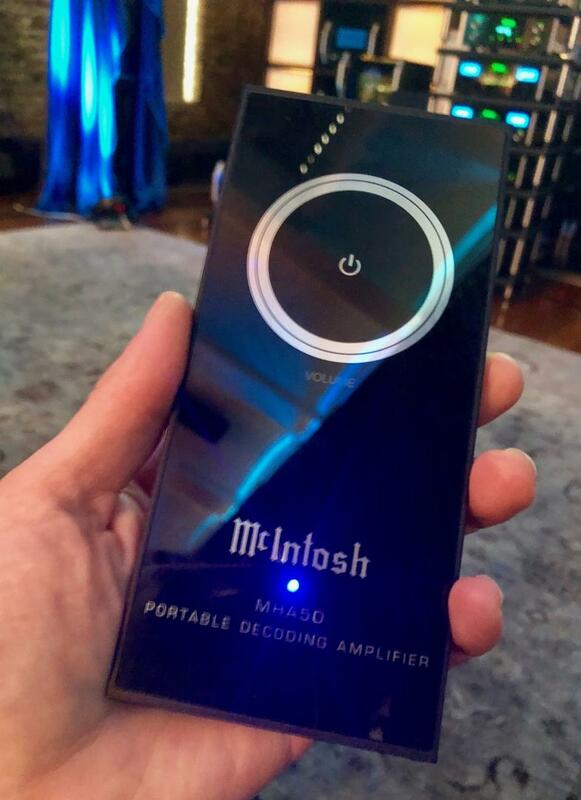 Let’s begin with the most unexpected McIntosh product: the new MHA 50 portable headphone amplifier/DAC (identified as a “portable decoding amplifier” on the front plate), pictured below. It will retail for $700, and I was told shipping would start soon. This remarkably slim and lightweight device features a crossfeed circuit, and its front look vaguely resembles a classic iPod. I didn't have the chance to give it a listen. 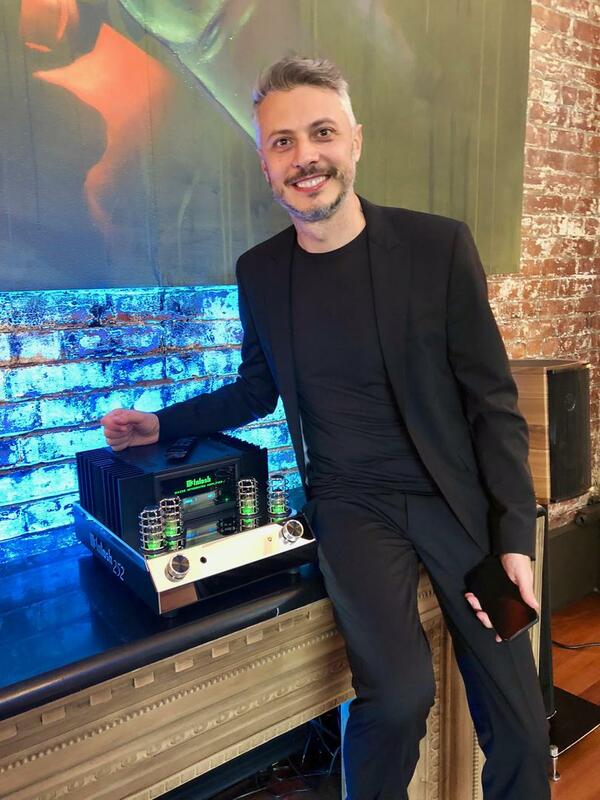 I don’t mean to “laundry list” this part but McIntosh introduced five new integrated amplifiers—in descending price order, the MA9000, MA8900, MA7200, MA5300, and MA252—plus a MAC7200 receiver with AM/FM tuner, a sort of homage to the old school Mac. If that weren’t enough there’s also the new MC1.25KW quad balanced power amplifier, an efficient Class AB affair said to offer double the capacitance in the power supply (over the previous model) for more instantaneous power. 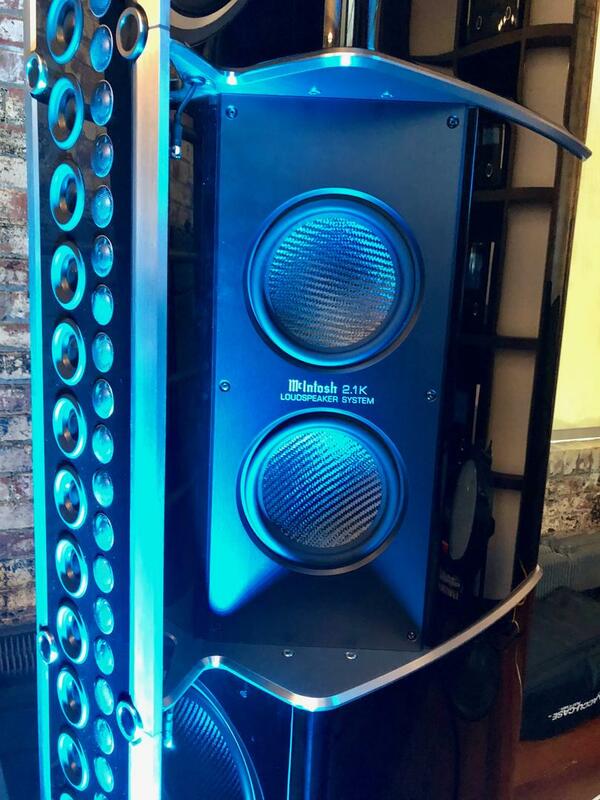 A pair of these 1250W big boys drove the new McIntosh speakers (more below). On the entry-level front, the 100Wpc MA252 integrated amp is a hybrid design with a tube input stage and a solid-state output stage, along with a high-drive headphone amp. With its more diminutive chassis dimensions and classic-meets-modern look that references the MC275, it was easy on the eyes—and the ears, too, I’d expect (it was on static display). I’d be curious to put one of these through its paces. It retails for $3500 and could suit the crossover market nicely. 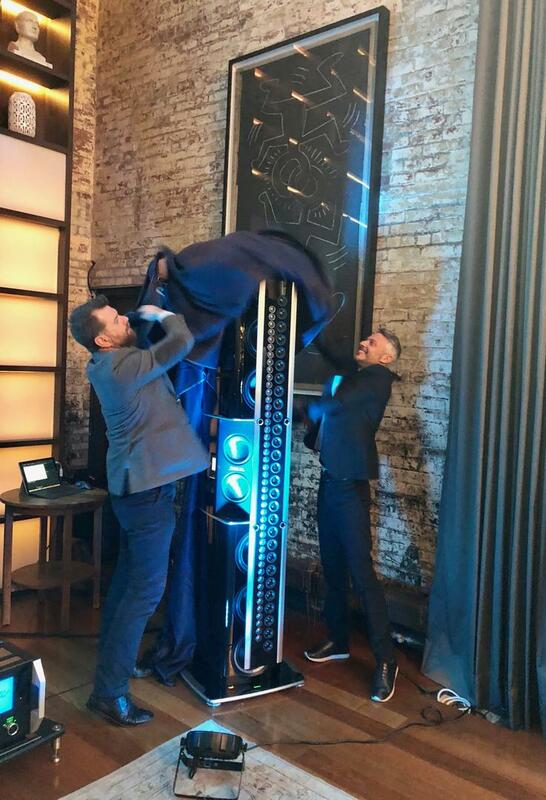 But perhaps the biggest news (literally and figuratively) was the unveiling of the mighty McIntosh XRT2.1K loudspeaker, a doozy of a statement physically and sonically. 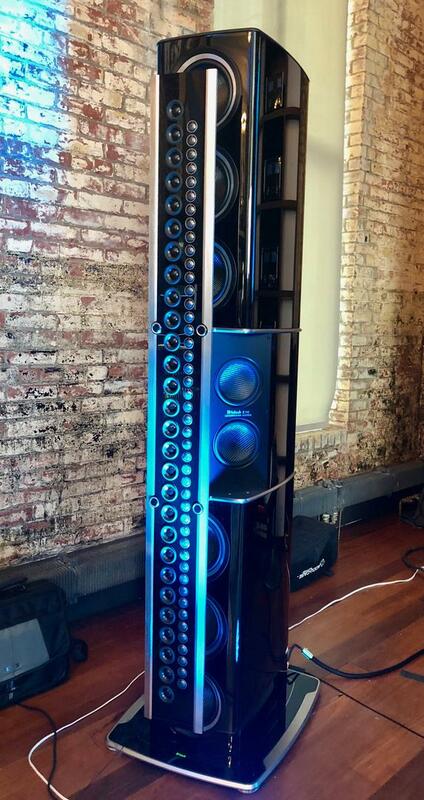 Seven feet tall, with a total of 81 drivers, the full-range four-way boasts (6) 8” woofers, (2) 6.5” low-frequency midranges, (28) 2” upper-frequency midranges, and (45) ¾” tweeters. The diaphragms of the woof and lower-midrange are brand-new designs made of a nanocarbon fiber and Nomex honeycomb combination. A line array suspended from the front of the bass cabinet houses the aluminum-magnesium upper-frequency drivers and tweeters. The steel spiders that attach the array are capped in knob-like silver-aluminum covers that echo the look of the front-panel controls on McIntosh amplifiers. In another nod to classic Mac style, the logo on the front of the base plate can be backlit in the same soft green glow seen in McIntosh electronics. The McIntosh Group’s Chief Design Officer Livio Cucuzza says that skyscrapers served as a key design inspiration for these towering vertical monoliths. Indeed the skyscraper image shares associations with the McIntosh character—power, technology, American invention, etc. The speaker enclosure sports a finish of seven layers of high-gloss piano black paint. Why a line array configuration? It’s what’s used for live music. 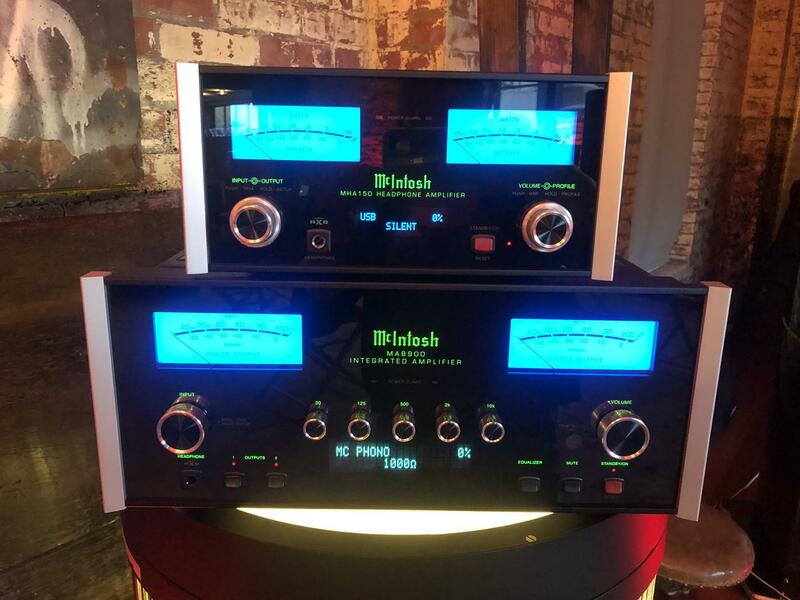 (McIntosh famously provided amplification for live music events such as Woodstock and the Grateful Dead “Wall of Sound” setup of 45 amps.) Also, it can also optimize off-axis listening and project sound at greater distances than a traditional point source design. According to Tezzon, the fundamental goals for the XRT2.1K’s design were to improve power handling, reduce THD, and enhance soundstage focus. But how did these giants sound, you ask? I offer some impressions from the demos that might be taken with a grain of salt. As promised, this line source configuration delivered quite even dispersion across a broad range of listening positions. Moving further back in the space didn’t give the usual impression of decreasing volume level. Given the huge number of drivers, I was pleasantly surprised by the degree of coherence and sense of linearity. Apparently spreading the sonic duties across more drivers can lower distortion. Sensitivity is 90dB and (happily) bi-amping, tri-amping or tri-wiring is possible. As befits such a grand flagship, the XRT2.1K’s price comes in at $130k. In this demo setup, the XRT2.1Ks were driven by a pair of the new McIntosh MC 1.25KW quad balanced monoblock amplifiers, a C1000 tube preamp, an MP1100 phono pre for analog (McIntosh MT5 turntable with Sumiko Blue Point mc cartridge), and a D1000 preamp for digital sources (mostly a Mac laptop). Enough detail and tech talk. I came away with the impression that the McIntosh XRT2.1K speakers were built for the full forces of rock ‘n’ roll. There was a sense of unrestrained yet effortless power. But that’s not to say that tracks from other musical genres didn’t play well, too: well-recorded choral pieces scaled appropriately, fiery flamenco stomps thrilled in impact. Soundstaging was portrayed with plenty of depth and width, and, as you might guess, these towering speakers do convey solid sense of scale. Overall theMcIntosh XRT2.1K delivered plenty of speed on transient attacks, crisp detail, and musicality in spades. The demo began with Lou Reed’s “Walk on the Wild Side” where bass response felt deep and pretty tight. Generally speaking, these speakers generated some pretty deep bass—on my EL VY disc, for one. Even the few moments—such as Mighty Sam McClain’s “Too Proud”—when the lower octaves veered into slightly less controlled territory, it really didn't detract from my enjoyment of the music at all. As with live music, the XRT2.1Ks pump out a musical presentation that is big, substantial, and exciting. Here, a whole lotta drivers equals a whole lotta sound waves. You could say these are party speakers in the best sense. The real test: Did I get goosebumps? Yes. I’m not ashamed to admit it was on Pink Floyd’s The Wall during the hard-hitting percussion and striking chord build-up of the transition into “Another Brick in the Wall, Pt. 2”—not a particular favorite but it did the trick. Although they seemed larger-than-life and almost hyper-real at times, in their own way, those McIntosh XRT2.1K speakers were showstoppers. In fact, a handful of us stuck around after the event had ended just to soak up some more soundwaves, taking turns choosing multifarious tracks from CDs, Tidal playlists, and more. Our collective enjoyment underscores a key purpose behind the townhouse: to bring people together to bask in the delights of listening to music. UP NEXT: Read Part Two of Julie Mullins' report on the new Sonus faber Aida loudspeaker. Disclosure: The McIntosh Group covered my NYC travel costs and accommodations.